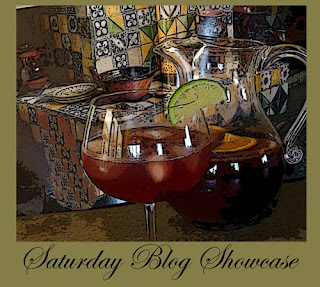 Lori of All That Splatters is hosting this week's Saturday Blog Showcase. If you would like to participate just prepare a recipe that you found on another blog and share it on your blog. This week on the Saturday Blog Showcase I'm highlighting a recipe that I found on a blog new to me - Week of Menus. 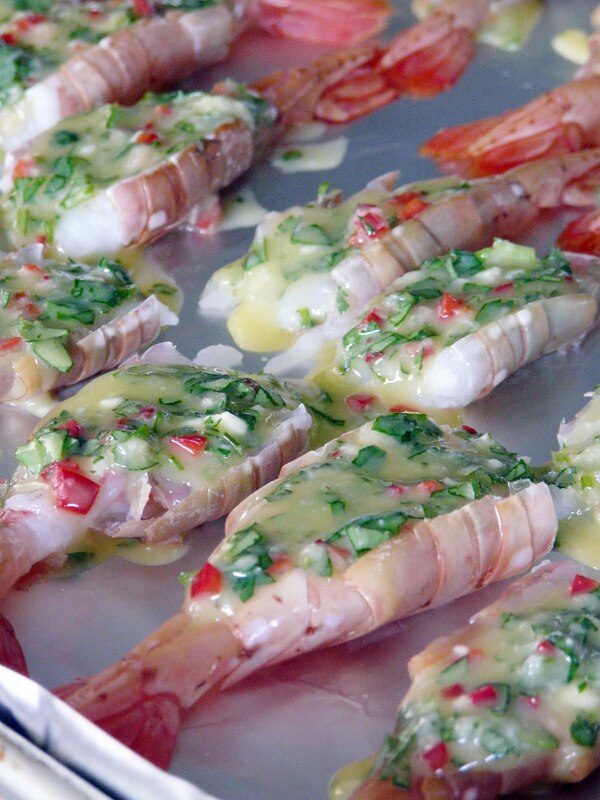 Joanne, the author of this blog, shared her mom's recipe for Firecracker Shrimp. I saw her photo for the shrimp on Tastespotting and knew that it would taste as good as it looked and I was right. 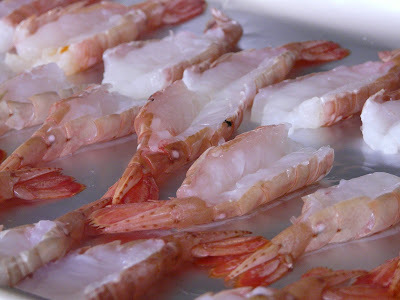 Moe stopped at the fish market in Cowichan Bay and picked up a pound of my favourite local Spotted Prawns. I followed the recipe almost to a T including preparing the prawns, as demonstrated, by cutting off the little legs and butterflying. Although I only used one pound of prawns I used the full recipe for the sauce. Rather than a red bell pepper I went for spicy and used a hot red chili. We made a full meal out of the prawns. The only side was the homemade baguette that we used to sop up all the wonderful garlic sauce. This is a recipe I will be making often. But next time I won't leave the shell on the prawns. I'll butterfly with just the tail left attached. Arrange oven rack so that it is closest to the heating element. Preheat oven to broil. Line sheet pan with foil. Place prepared shrimp evenly so that there is only a single layer and every shrimp will get maximum heat. Ann, they look delicious!! I love the idea of serving them 'simply' with a baguette. Perfect! I never met a shrimp I didn't love. The cilantro and lime are two of my favorite combos. 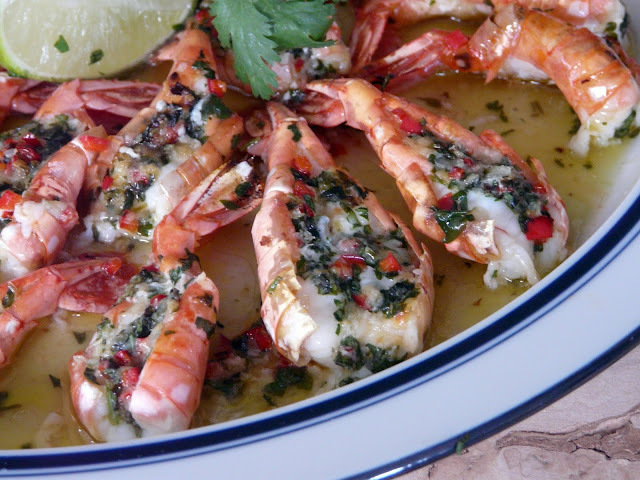 I would definitely love to make these for my shrimp loving family. Thanks! These look fantastic. I am so glad you found this recipe. I actually like the shell on. I like it to be very crispy and it adds a lot of flavour. Chinese friends introduced me to it. 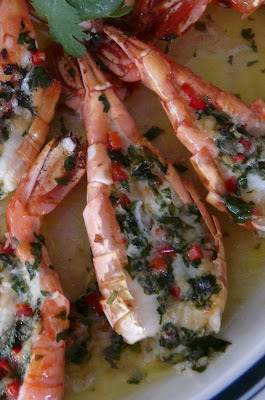 Funny, I happened upon Week Of Dinners this week also and bookmarked this shrimp. It looks super yummy! Ann, that does look and sound wonderful! Seems like we all noticed this one! I had it printed out but I love getting your take on it- I'll definitely double the sauce! Oh my gosh, Ann, do those look GOOD! I immediately wanted some bread to soak up all those wonderful juices. Yummo! You were smart to make the full recipe for that. I'll probably just do the red pepper since my tummy can't handle the hot stuff too well. Thanks for sharing this one because I didn't see Joanne's. Oh what a 5 star treat! Thank you Ann..
Ann - yours look gorgeous too! I'm sure with the extra doubled sauce...there was lots of yummy goodness to sop up. Great idea. I also love the dish you used to cook them - makes oven to table easy! I'm new here, but tomorrow I'm off to the market for prawns. The chili idea is great. It's great, gonna follow too. Oh my goodness this looks spectacular! Well done...delicious! Oh boy these look just wonderful! 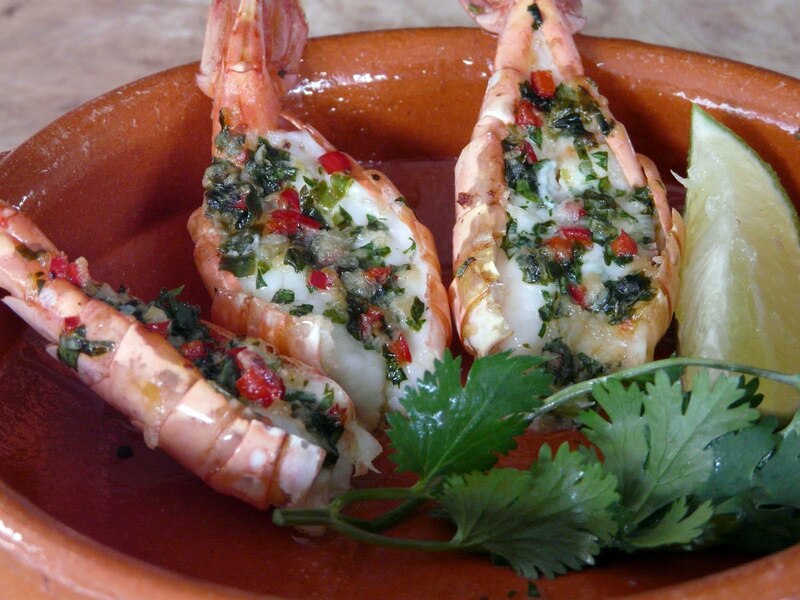 Looks so delish Ann - I love shrimp and spicy. Hubby is not a shrimp fan so next time he's out of town this is going to be my treat.